Warm up. 3 colours keep ball overlaps. 3rd man running. pass in sequence red -->blue --> yellow --> red. Play forward where possible, man reciving side on trying to play straight through. only pass with quality switch play dont take risks. 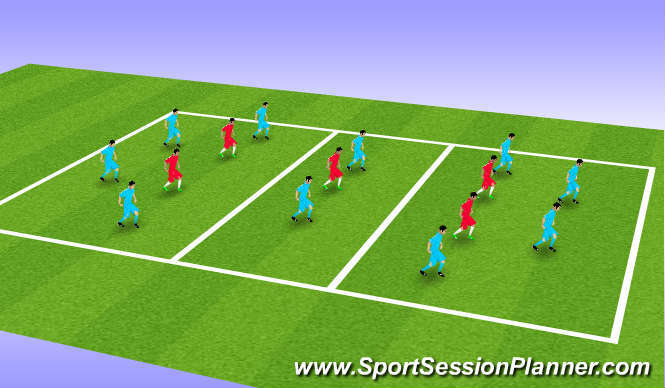 passing reciving turning short passing reciving side on ie back foot. movement creates space 1 run for defender on for ball. short sharp movements speed endurance. can player retain self control in competative practice. Struggled with warm up. passing sequence but persisted with it untill they understood overlapping & communication. Main session on passing through went well. A lot of negative play at first more of a keep ball but got better and more direct with coaching & understanding.